Today in Masonic History Derwyn Trevor Owen is born in 1876. Derwyn Trevor Owen was a Canadian clergyman. Owen attended Trinity College in Toronto, Ontario. He was ordained in 1901. He would hold the curacies, responsibility for those in parish, of St. John's Church and St. James Cathedral both in Toronto. 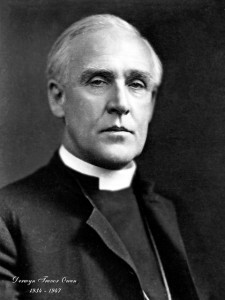 In 1908, Owen was rector of Holy Trinity Church in Toronto. He would be Deam of Niagra until his ordination as a bishop or episcopate. In 1925, Owen was consecrated as a bishop and was enthroned as Bishop of Niagra. In 1932 he was translated to the Bishop of Toronto. In 1934, Owen was elected as the sixth Primate of Anglican Church of Canada . He would retain his position in Toronto and would be styled the Archbishop of Toronto. This was was despite the fact the Toronto was part of the Diocese of Ontario. Owen would pass away on April 9th, 1947. Owen was a member of Ionic Lodge No. 25 in Toronto, Ontario.